Learning about measurement based care, why it matters, and how it can power your clinical work (WILLOW Path to Wellbeing). Tobyn Bell is a cognitive-behavioural psychotherapist and registered nurse who specialises in compassion focused therapy, and is part of the training executive for the Compassionate Mind Foundation. He is the co-author of the forthcoming book: Compassion Focused Therapy from the Inside Out: A Self-practice/Self-reflection Workbook for Therapists. Tobyn has published research on clinician's use and understanding of mental imagery and on the development of an 'internal compassionate supervisor'. Tobyn is a trainer, supervisor and programme-lead at the Greater Manchester West CBT Training Centre (NHS, UK), and offers national training on the subject of mental imagery and compassion. Kelly Koerner, PhD is CEO and Creative Director of the Evidence-Based Practice Institute, LLC, where she combines technology, design, and social enterprise to help clinicians improve clients' outcomes. She is an expert clinician, clinical supervisor, and trainer in Dialectical Behavior Therapy with specialized training in other evidence-based practices. As a trainer, she is known for her warmth and highly engaging, practical teaching style. She is adjunct clinical faculty at the University of Washington. Her recent book is, Doing Dialectical Behavior Therapy: A Practical Guide. Graciela Rovner, PhD in Rehabilitation Medicine and Senior Pain Specialist Physiotherapist . She is nominated by the Swedish Association of Physiotherapy as the Physioterapist of the year, 2014. Graciela is the first physiotherapist peer reviewed ACT trainer in the world. She holds three Master Degrees (in Clinical Medical Sciences, In Physiotherapy and in Psychology). She is the Past Acting Director of the Association of Physiotherapy, Mental Health section recently the Chair of the Swedish Congress in Behavioral Therapies, in Gothenburg, 21-22 March 2014. She is a clinician part time, supervisor and researcher at the Dept of Rehabilitation Medicine, Sahlgrenska Academy at Gothenburg University with special focus in ACT-based chronic pain rehabilitation, assessment and design of "individualized" group rehabilitation programs. She trains and supervises inter-professional teams (doctors, physios and psychologists) and is one of the most appreciated lecturers and workshop leaders. Her areas of expertise in ACT are chronic pain and inter-professional rehab. She deepens also in how to deliver Body Based Mindfulness based in Functional Behavioral Analysis and how different guiding styles predicts different outcomes. Benji Schoendorff is the Director of the Contextual Psychology Institute in Montreal and is a sought-after ACT and FAP trainer who has given over 210 workshops the world over. 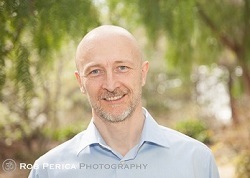 He is a licensed psychologist with an infectious passion for training. His blend of humor, compassion and finely honed clinical skills make for a compelling training experience. Author and co-author of books, chapters and articles on ACT and FAP, Benji is most proud of the Essential Guide to the ACT Matrix (2016), a step-by-step approach to supercharging your ACT and FAP practice with the matrix. Benji loves to learn—currently the guitar and Spanish. Most of all, he loves living near Montreal with his beloved wife and colleague Marie-France Bolduc, son Thomas and step-daughters Ariane and Camille. Determine Which Path is Right for You?